Former Peterhead manager Neale Cooper is fighting for his life in hospital following a suspected accident. The 54-year-old was discovered in the stairwell of flats in the Bucksburn area of Aberdeen in the early hours of Sunday morning with serious injuries. He was rushed to Aberdeen Royal Infirmary where he remains in a critical condition. It is thought he had fallen.Police are curerently investigating but said there were no suspicious circumstances. Detective Inspector David Howieson said: “Police inquiries were ongoing throughout the night to establish the full circumstances. The former Aberdeen player, who was part of the legendary European Cup Winners Cup winning team of 1983, had a health scare last year when he suffered a heart attack in June. 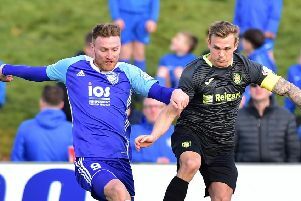 Peterhead FC’s general manager, Martin Johnston, said the thoughts and prayers of everyone at the club, where Cooper managed from 2008-11, were with him. “It’s a particularly difficult time for him and his family and we’re hoping that he manages to pull through,” he said. “He’s highly regarded here at Peterhead Football Club. He made a lot of friends and still has a lot of friends here. “We’re all rooting for him and that goes right across the board. During his time at the Blue Toon, Cooper guided the side to a play-off place in 2009, where they eventually lost out to Airdrie. He also managed Ross County, Gillingham and had two spells at Hartlepool United. As well as Aberdeen, where he won he won two Premier Division championships, four Scottish Cups and one League Cup, he also turned out for Aston Villa, Rangers, Reading, Dunfermline Athletic and Ross County during his playing career.